Fantastic old fashioned pub, well filled by lunch time drinkers on a wet Friday. A pint of Spitfire (4.00) was fine, staff were coping well & swapping banter with all & sundry. Visitors to London can have pre-conceived ideas about City pubs, I know I did, but this one could be poked on any high street in the land, or back street for that matter and not be out of place. 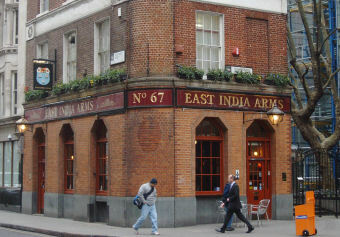 One of my favourite pubs on the City chapter from 'London Pub Walks' in the book of the same name. Impressive building standing the test of time surrounded by faceless office buildings. Shepherd's Neame beer and naturally a yuppie clientele but still relatively mixed crowed. Recommended if you're in the area. Small homely Shepherd and Neame pub in the city, right next to Fenchurch St station. Dangerous stairs to the toilets on the left as you enter from the street off Fenchurch St, I can imagine there's been a few near misses in the past! Wooden floors throughout and old Shepherd and Neame memorabilia on the walls and some excellent GB bunting hanging from the ceiling. A city pub but good clientele like a homely local should have. Both Spitfire and Master brew on but to be honest both tasted a bit bad, so maybe the pumps need a clean.